This sling is designed for weapons equipped with receiver mounted rear QD swivel sockets. The Viper Sling functions in the same way as our MOUT Sling but with a couple of big differences. First, the main portion of the webbing that supports the weight of your weapon across your shoulder is 1.5" wide on the Viper Sling vs. 1.25" on the MOUT sling. This extra width really helps on heavier weapons such as fully equipped M-4's. The second big difference is the addition of shock cording, housed in tubular webbing, on each end of the sling. This shock cord allows you to sling up a little tighter, yet easily cross shoulder transition. Not to mention the benefits of shock absorption during aggressive movement. The third difference is the addition of a second emergency release buckle on the sling loop itself. This gives you the option to disconnect from the weapon and keep the sling on your body, or to disconnect the sling from your body, or both if you're so inclined. As with the MOUT Sling, the Viper Sling in intended to be used on a weapon with a side receiver sling mount. The body loop secures the sling to a single mounting point. 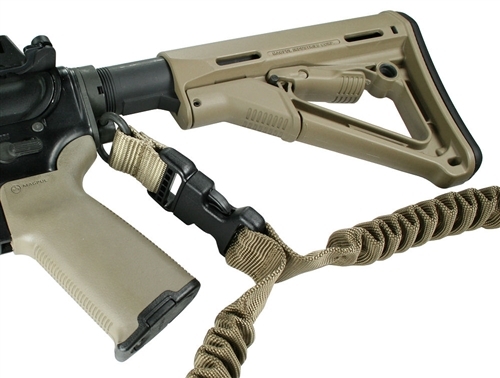 The Viper Sling features a side release buckle assembly that is intended to stay attached to the weapon at all times. The female portion of the side release buckle is permanently attached to the sling itself. With the male portion of the side release buckle attached to the weapon, and the female portion attached to the sling, the sling remains wrapped around the operator's body when the release buckle is disengaged. This is the key feature of this design. 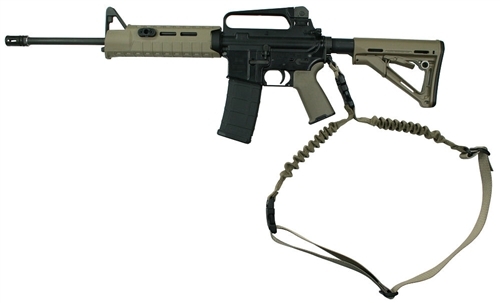 If it becomes necessary to unhook the weapon from your body, such as when firing from an unconventional shooting position outside of the capabilities of the sling or something as simple, yet hazardous, as mounting/dismounting a vehicle, there isn't 3 feet of webbing trailing from the weapon. This allows the operator a much greater degree of versatility and safety.